Of course, as a typical parent-to-be, I agonized over what name I was going to call that boy when he was born. I combed the family tree and bought name-the-baby books. My husband nixed my favorite name, so I chose another. I still use those baby name books everytime I create characters for a new book. Choosing just the right name is important, whether it's for a child or a pet or a novel's villain. Bible names usually had meanings associated with them. Uzzi means "the Lord is my strength." Indeed, God sometimes changed a person's name to reflect the person's changed status -- Abram (father) to Abraham (father of many), Jacob (he grasps or he deceives) to Israel (he struggles with God). Jesus renamed Simon (one who hears) as Peter (rock). In Revelation, Jesus promises that anyone who overcomes will receive a new name which no man knows, save him who receives it. Names, names, names. The Bible is full of names. 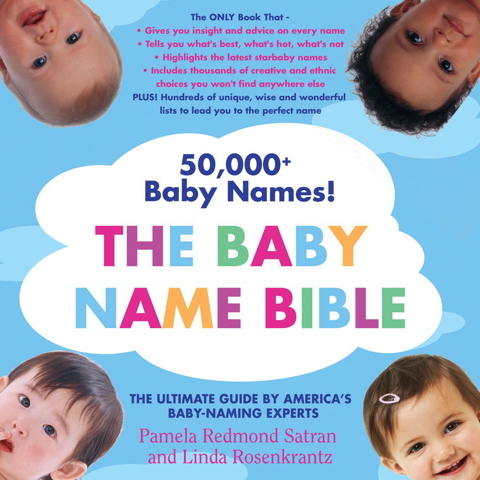 Entire chapters are devoted to naming names. Genesis 1-3 tell the story of the creation and fall, and then by Chapter 4, after the story of Cain and Abel, we find a list of names. What is the significance of naming Cain's descendants anyway? Wouldn't they have all perished in the Flood that killed everyone except Noah and his immediate family(Genesis 6)? And as soon as we reach the end of the Flood story, we find another chapter of names. After that list, we read the tower of Babel story, which is followed by ... you guessed it, a list of names. Flip to the New Testament and Matthew 1 is -- do I need to say it? I have to be honest. I find these lists of names a little boring to read. Okay, I said I was being honest -- I find them a lot boring. I mean, have you ever tried to read each and every name in I Chronicles 1-9? I searched to see if I could find the number of named people in the Bible, but I guess no one else has counted them all either. What's up with all the names? Why were they included? After all, until the invention of the printing press, every word, every letter, in the Bible had to be handcopied. What is the significance to me, a 21st century American, that God would include so many names in His word? And then I began to realize that even though I'd never given a thought to Akkub or Haahashtari or Janna or Arphaxad, each one of them is important to God. If you've ever spent time with someone who called you by the wrong name, you probably remember how slighted you felt. I had a boss who consistently called me by the wrong name -- and even wrote it on a check once! Conversely, when someone makes an effort to remember our name, we feel valued. God warns us in the Ten Commandments not to take His name in vain. To this day many Jews write G-d to show the sacredness of God's name. Of course, the name above all names is Jesus. Indeed, Paul wrote that every knee would bow at the name of Jesus. The Bible begins and ends with names. At the very beginning, God brought the creatures of His newly created world to Adam to be named. And Revelation tells us that at the end of time, God will check the names in the book of life. Amazing. The same God who cared enough to include Eliab and Zattu and Chenaanah in the Bible knows us by our names also. And He never gets them wrong. Have you tried to read the entire Bible, including those chapters that are lists of names? Do you have any interesting stories about your name or how you got an unusual nickname? Nice devotion, CJ! I was just thinking the other day about the lamb's book of life. I just saw my first cover with my name on it, but being one of the many names listed in God's book is much sweeter. Looking forward to a new name! Any kid who was ever saddled with a name they hated, know they carry a sort of power with them. Lisa is a derivative of Elizabeth and means consecrated to God. I never liked it growing up, but maybe I'll grow into it one day. I love finding out about names. Maybe because hardly anyone gets mine right. Yeah, right. That couldn't be it. It must be Diane or Deann or Deana or Dana or D'An or DeeDee or Diana. Or if they DO get DeAnna right, then they don't get that freaky capital A in the middle. Ugh. SO frustrating. No, it's not a name I would have picked in a million years (thanks, Mom), but is it really THAT hard? If I had a daughter, her name would be Mary or Jane or Ann. No, wait. Is that Ann or Anne . . .
No one ever gets my name right. I don't expect them to. Reading through the entire bible is a blessing. I have made it through several times and even those lists have blessed me with God's attention to detail. My great-grandfather's name was Laben and I always wondered who would pick a name like that for their son when it has such negative connotations? Shadrach Williams was my first family member in colonial America. That at least is associated with good! Barb, I with you on the name meaning thing. My name means "the moon." Eh. Fortunately, pretty much no one cares about name meanings except maybe the name bearers. Lisa, is your "real" name Elizabeth, or did your parents name you Lisa? There was a time when parents gave the nicknames as the official name, which made it hard to switch to something more grown-up later. I was named for my grandmother -- who didn't actually use the name. She went by her middle name. There's a problem with the really common names like Jane or Mary too. If you have a common surname (like Smith or Jones or even Chase), you find you're not unique. My husband is a David, which is one of the most common of all men's names. Combine that with Chase, and there always seem to be several of them in the phone book everywhere we live. We got calls for another David Chase on 9/11. (We lived in the DC area. The other one worked at the Pentagon back then. He and my husband also used to get each other's emails since they both work for the Navy and people couldn't remember which email went with which David.) A year or two ago we got an $8,000 bill for a funeral in Maine. Turns out the funeral home looked up an address in the phone book and sent it to the wrong David. Of course, that wasn't an issue for me -- until I married a guy with a common name. For my kids, I tried to get a name that wasn't in the top 50 names or so, just so they wouldn't have so many doubles. But I have noticed that looking at a list of names from the colonial period, you realize how familiar those people were with the Bible. They didn't just use the common names, but they used the less common ones too -- names like Adonijah and Keziah. CJ, I will confess that I am one whose eyes glaze over at the lists of names in the Bible. I never knew the meaning of my name until your post inspired me to research it. I think I was never motivated to look it up because I was saddled with the most common of names: Susan Smith. And I married into the almost as common: Johnson. Susan means "lily", derived from an early Egyptian word that means "lotus flower". The Hebrew meaning of the word is "to be joyful, bright, or cheerful", which is the basis for the word and name Sasson, meaning "joy of life". Nope, CJ, I was really named Lisa. Growing up I would MUCH preferred Elizabeth. There were always soo many Lisas in every class I was in. I hated it. Oh, and DeAnna it's always Anne with an e as any good fan of L.M. Montgomery knows! Fun conversation. Suzie J, we have such a lovely meaning for our name. I like it. I also like that it has ancient roots. That said, when I was a kid I used to want to be named Lisa quite badly, Lisa. My middle name was misspelled when I was born. I won't elaborate. But I get comments from time to time from loan officers or whoever, informing me my middle name is wrong. Yeah, thanks. There's great power in names. Thank you for the devotional. Suzie, you could always call yourself Lily. Wouldn't that confuse a few people. Many years ago, I knew a woman who legally changed her name to Susan. (Well, I think she spelled it Susen, but you get the idea.) I can't remember what her birth name was anymore. But it's kind of funny that most of us wish we could be someone else -- or at least have someone else's name. The question becomes, would we have turned out differently if our parents had chosen a different name??? Lisa, I thought of Anne (with an 'e') Shirley too. Susanne, I'd think in the days of cr8tive names, people would stop commenting on your unique middle name. Honestly, some of the names coming home on the class rolls these days make me feel sorry for the poor kids who are going to spend their entire lives correcting the spelling of their names.